Wood is a product of nature, which means that even lumber that has been pressure treated is vulnerable to the fading power of sunlight. 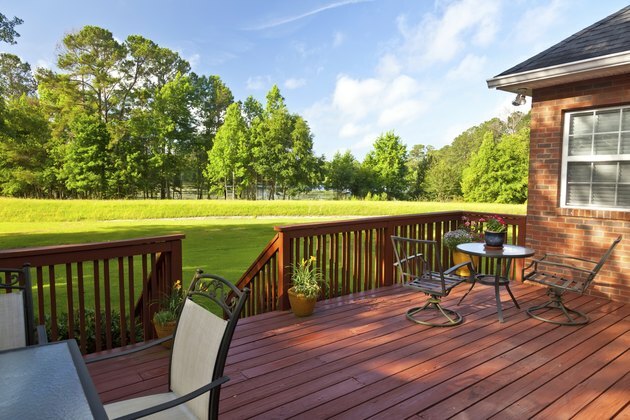 A semi-transparent exterior wood stain helps maintain the fresh appearance of a pressure-treated wood deck and provides added protection to the wood fibers. Many manufacturers recommend waiting for three to six months before applying a stain or sealant to new decking, but other experts advise staining exposed lumber immediately. The option you choose determines which type of surface prep is necessary before applying the finish. Semi-transperent stains keep your deck looking its best. Pressure-treated lumber often displays a green cast because of one of several copper-based preservatives. Some new lumber also features a slick surface known as mill-glaze, which repels water and inhibits the absorption of some types of protective coatings. If that's the case, prep your deck by gently roughing up the surface with a drywall pole sander equipped with a 60- to 80-grit sanding screen; then brush off the surface with a broom. If your lumber has no green cast or discoloration and displays no mill glazing, you can safely skip this step. If you decide to wait three to six months before staining your deck, most unstained pressure treated lumber will begin to turn gray. The wood may also become discolored from foot traffic, wet leaves or spilled food. To restore the wood to a like-new appearance, you can gently scrape any affected areas with a carbide blade scraper. For a less labor-intensive option, wash the lumber with an oxalic acid deck-cleaning solution or an environmentally friendly alternative. Most deck cleaning fluids are also effective at removing surface mildew that may form on top of the wood. For the best results, select an oil-based semi-transparent exterior wood stain. Unlike water-based stains and sealants, oil-based stains penetrate beneath the surface of the wood to provide deep protection from harmful ultraviolet rays. In addition, the solvent in these stains will break up any residual mill glaze or wax. Unlike film-forming coatings, penetrating stains hold up well against foot traffic. This class of stain is manufactured in a variety of wood tones -- such as redwood, cedar or oak -- that highlight the wood's grain structure. Begin your project on a day when the wood is dry and no rain is expected for at least 24 hours. You could use a paintbrush, but semi-transparent deck stains can be applied to PTW more quickly using a paint roller attached to an extension pole. For an even easier option, use a garden pump sprayer, which allows you to more readily apply stain to the gaps between deck planks. Apply a generous first coat of stain and allow it to soak into the lumber for 2 to 3 hours. Follow up by applying a thin second coat. Allow the stain to dry for 24 hours before using the deck.